The Rebel Sweetheart. 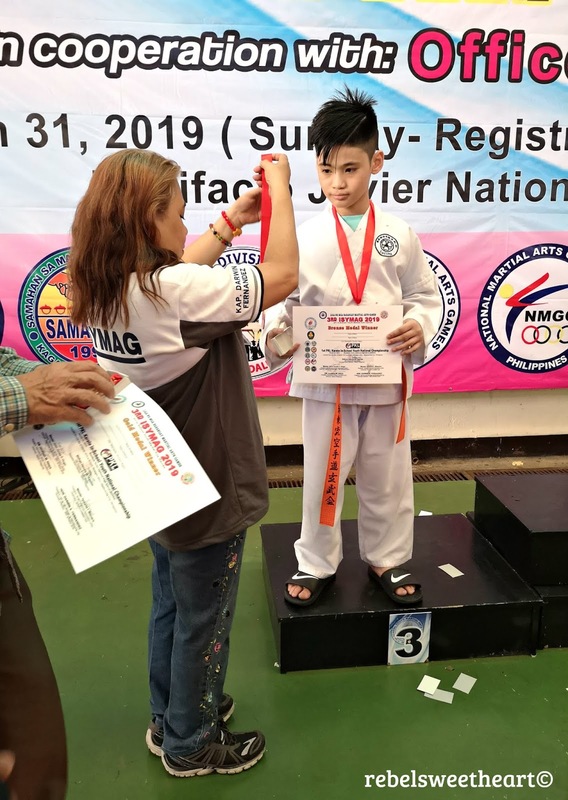 : ISYMAG 2019, and the Importance of Tournament Competition in Martial Arts. 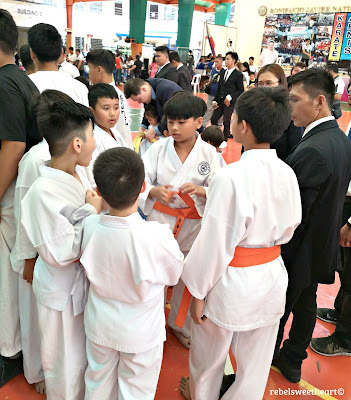 ISYMAG 2019, and the Importance of Tournament Competition in Martial Arts. When I signed my son up for karate lessons four summers ago, I only had one objective in mind - self-defense, so my son can fight against bullies. Back then, Yue was a meek five year-old, who's been on the receiving end of several bullying incidents in his class. He could not fight back, mostly because he did not know how to, and would just end up crying. But now, look at how far Yue has come! 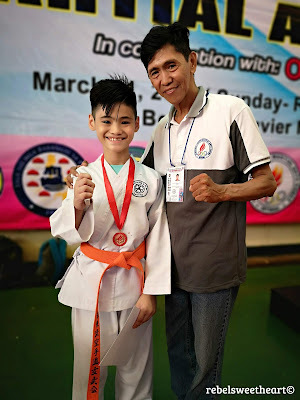 Not only is he preparing for his next belt test (he's looking forward to becoming a 7th kyu green belt in Shito Ryu Karate), he also has a tournament experience to his name. Together with his teammates from Demuraha Shito Ryu Genbukai Laguna, Yue participated in his first-ever national karate tournament - the In-School Youth Martial Arts Games (ISYMAG), held last Sunday (March 31) at the Bonifacio Javier National High School in Mandaluyong City. Demuraha Shito Ryu Genbukai Laguna, represent! The kids trained long and hard for this event, which is already an achievement in itself considering that these kids had to juggle sports and academics, and excel in both. 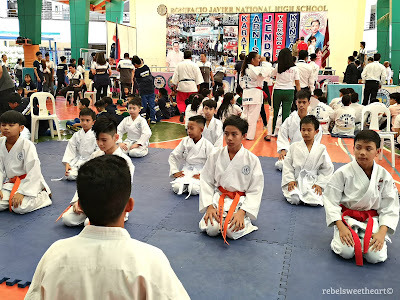 While some kids (and their parents) are often hesitant to enter tournaments, perhaps worried about the danger that it entails, these kids were quite eager to join ISYMAG and were more than willing to extend their training hours to prepare for the competition. Together with karatekas from other teams. For young karatekas, tournaments can provide great insight into their own strengths and weaknesses, both in terms of karate skills and their ability to perform under pressure in a competitive environment. 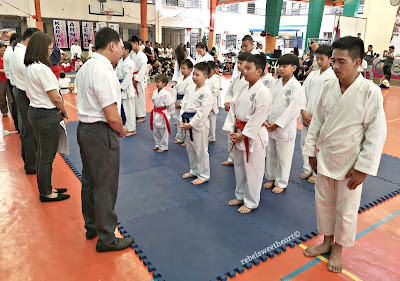 They will be acquainted with karate practitioners from other teams/clubs, and in the process, they will be able to understand and assess their own strengths and weaknesses. 2. A test of skills. All those months or years of training will be put to a test once you enter a tournament competition. Your physical fitness, technique, stamina, timing, and mental strength will all be tested in a way that regular karate training can not. Just like in belt grading, tournaments provide an opportunity to show your skill set, and how it has improved over time. A solemn moment before the competition kicks-off. 3. A step out of the comfort zone. Training in the same dojo with the same people and sparring against the same senpai/kohei week in and week out makes you comfortable. However, it can also make you complacent. Competing in a tournament – be it patterns (kata) or sparring (kumite) – puts you in unfamiliar territory, where you're forced to perform under the scrutiny of people you don't know. It's this aspect of stepping out of your comfort zone that will push you to work harder and do better. 4. A way to overcome fear. Staying calm amidst stressful situations is an ability that any karateka must learn. And what better way to test this ability than to compete in a tournament - a nerve-wracking situation, especially if you're doing it for the first time. Learning to relax and stay focused in order to be able to perform at the highest level is a skill that is only developed over many opportunities to try it in practice. 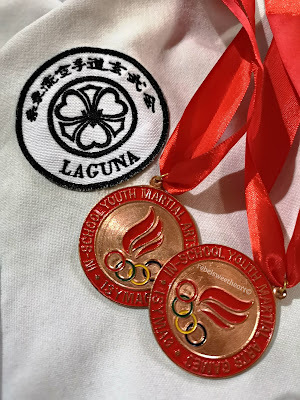 Competing in a tournament is a great way to develop self-confidence, especially among young karatekas. Tournaments give them the opportunity to display their skills and knowledge and show everyone the results of their training and hard work. For some students, having their name shouted in encouragement during a noisy tournament, and understanding that there is a whole team of people eager to witness their success can be a turning point in building self-confidence. Tournaments give you a chance to grow closer to your peers. When a team travels together, competes together, spends a couple of days in close contact with one another, cheers and encourages one another during the competition, the result is a more cohesive team spirit. We all want to 'belong' to something, and that sense of belonging is fostered by tournament competitions - you get to bond with people who share the same love for karate and/or martial arts. Team huddle, with Sensei Danny looking on. Winning and losing is part and parcel of any competition; and healthy competition is good. Not only does it help build mental strength and determination, it also offers a chance to learn about humility. In tournaments like ISYMAG, you will come across different kinds of competitors - some even stronger and more skilled than you are. This gives you the opportunity to test and hone your skills, recognize your weaknesses, and congratulate others for their successes regardless of how you fare in the competition. Contests of any kind provide valuable motivation for you to work hard and achieve your goal. 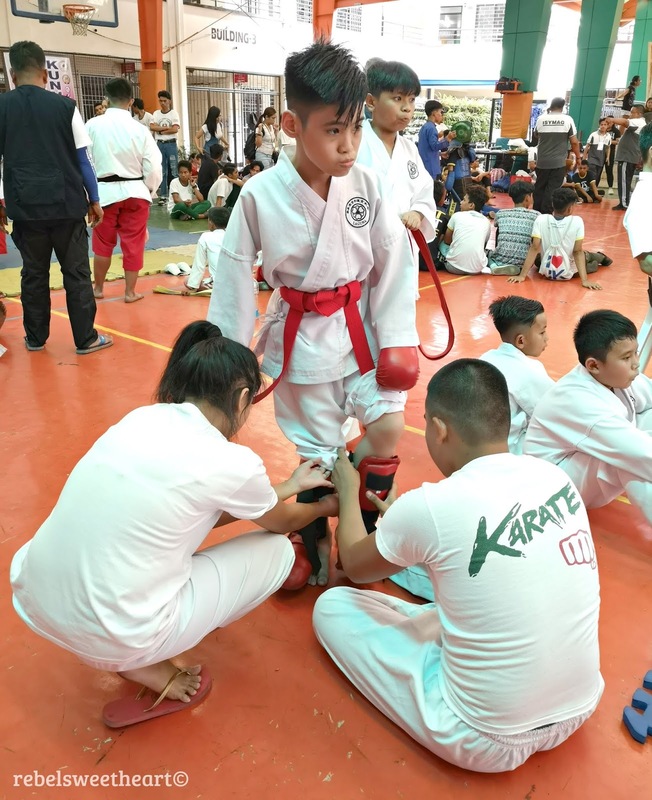 By entering a karate tournament, karatekas find additional motivation to hone their craft and be better in what they do. They get that 'extra drive' to train harder, become stronger, and be more resourceful as the tournament draws near. It is often in the weeks or days leading up to a tournament that karate students make enormous progress in their training. For karatekas like my son who are still moving up through the belt ranks, watching top level black belt competitors and meeting shihans from across the country can be very inspiring. It motivates you to continue with your training, and take it up a notch to be at par with the black belters and grand masters that you admire. 10. Show your skills... and shine. Entering a competition for the first time can be quite daunting, but at the same time, it can be very rewarding. You get the chance to display your skills, and show how hard you've worked and how much you have improved. Being able to show the world what you can do and what you're good at is already a rewarding experience, even more so when you get recognition for it. President of Jendo Philippines Association. and the Founding Chairman of the National Martial Arts Games Committee (NMGC). 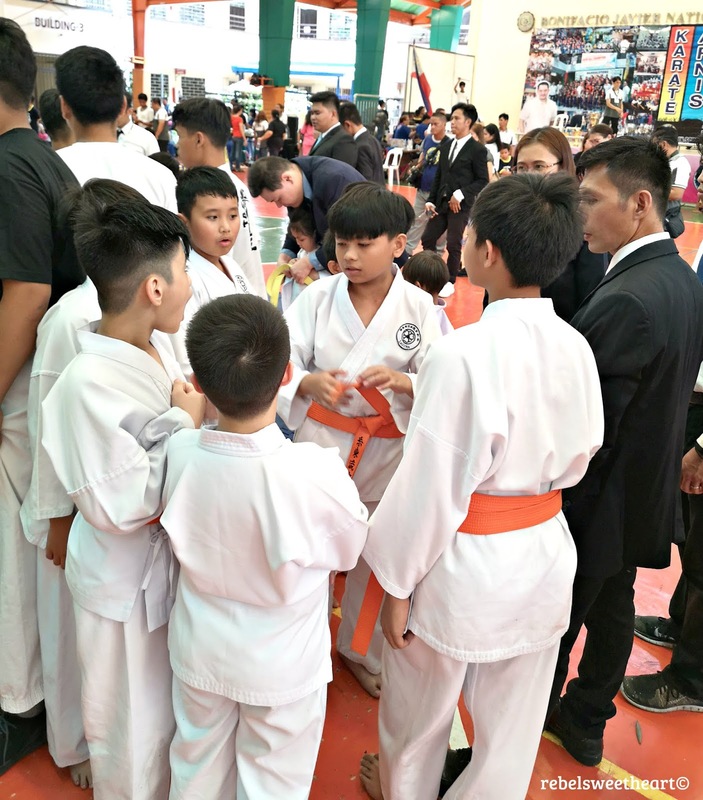 The In-School Youth Martial Arts Games is an annual sports event organized by the National Martial Arts Games Committee (NMGC). 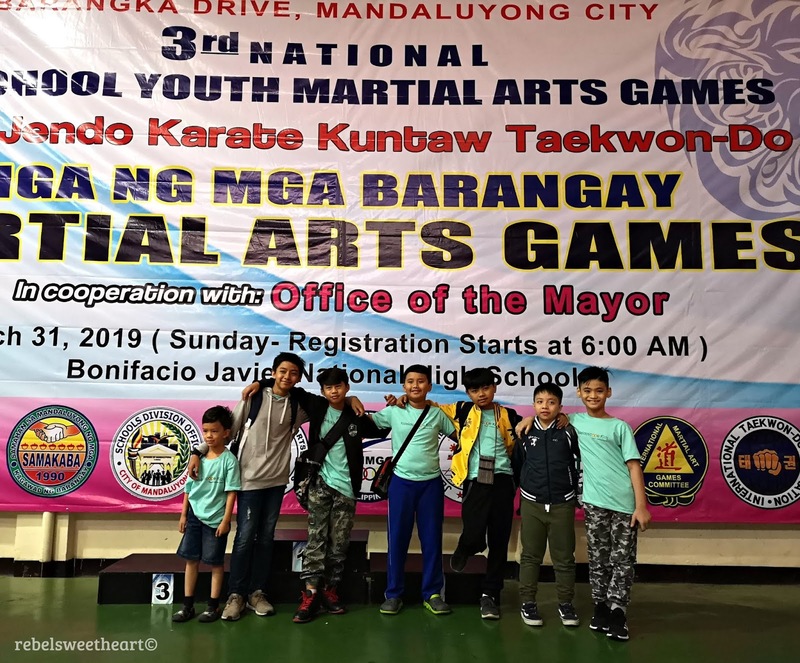 NMGC Philippines is a private, non-profit martial arts sports organization dedicated to the promotion and advance of Arnis, Jendo, Karate, Kuntaw, Sikaran, and Taekwondo under the umbrella of the International Martial Arts Games Committee (IMGC). Yue is a member of the Demuraha Shitoryu Genbukai Laguna, training under Sensei Danny Bualan, Senpai Louie Gelizon, and Senpai Jolan Asia. Classes are held every Saturday at Kaleidoscope Kids Learning Center. Enrollment is ongoing for their summer martial arts classes, which includes karate and taekwondo. This is really cool! I took Taekwondo as a child and I agree that it definitely helps you step out of your comfort zone and helps you make friends! I loved it! Best decision ever mum! go Yue!!! Noone ever deserves to be bullied! Fight fight fight! oh wow htis is so interesting- my little one is getting interested in this and i def would love to help her try it out sometime- seems like a great thing for them to do and learn! interesting read! 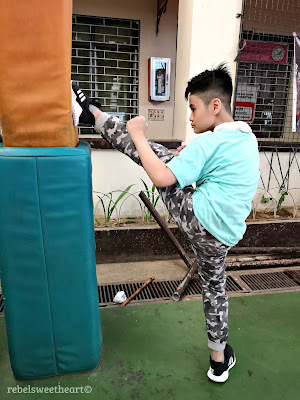 I never tried many sports, and one of my cousins is really interested in martial arts so i will definitely share this post with him! Wow amazing! Learning a martial art is so important, it teaches so much including confidence. Yes i can't agree more! Competitions are one of the most important factors to develop into a martial artists. Great post. My son is a long way from starting school but bullies are my biggest fear for him. I’d love to find a karate class near us. Sounds like it’s done wonders for your little. I had taken karate lessons as a kid but I never got the opportunity to participate in competitions. Now I understand that I missed out on such a big part of the experience. My niece is one of the best martial art students in their class. I think it is a good way to take our kids to this kind of class for them to know how to protect their selves in bad people. Interesting read! I used to practice during my school days too. I just loved your nice ideas to groom your child. They all look helpful for children and parents. This was very informative. I love sports and I always wanted to try Martial Ats. I can see why it would be a good sport for kids. This is a great defense of the reasons for kids to engage in martial arts and competitions. There is a lot to be said for the discipline and physical exercise involved, along with the other points you made. My only concern would be the minority of kids who might use martial arts to bully others, which is not the intent of martial arts. I sent my kids to a Martial Arts class last summer and they really enjoyed it. A conpetition is a great way to test their strenght. What an awesome competition. So important to let our kids try matial arts and learn how to defend their selves. I think it's definitely important that kids get to experience some sort of competition when they're growing up. My little sister's recently gotten into kick boxing and she loves it.